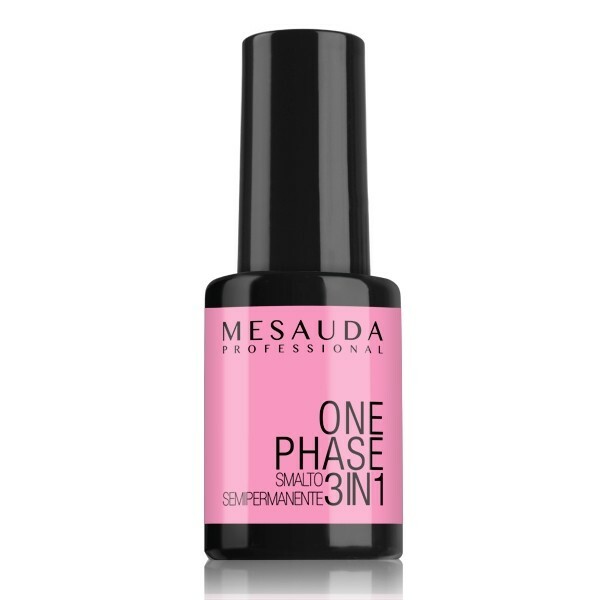 One Phase is a cutting edge semi-permanent nail polish which combines 3 products in 1. The innovative formula has an exceptional adhesion to the natural nail which allows the colour to be fixed without applying base and top coat and lasts on nails up to 10 days. One Phase is a valid alternative to the traditional application with base coat, colour and top coat as it allows to use one product without giving up the professional, shiny and resistant result of the semi-permanent nail polishes. One Phase cures under UV/LED light and can be removed in only 10 minutes with a Soak-Off Remover. A professional manicure with just 2 products: One Phase gel polish 3 in 1 and UV/LED Lamp. Shake well the bottle before use. Pushing back the cuticles with the cuticle pusher. Clean thoroughly around the cuticles removing all residues. Apply a thin coat of One Phase directly on the natural nail and cure in 36 Watt UV lamp for 4 minutes or 2 minutes in 36 Watt LED lamp. If using a lower wattage source, cure for an additional 1-2 minutes. One Phase does not release any dispersion layer, the manicure is complete and ready to be shown. Use a white block or file to remove the top surface for a better penetration of the solvent, being careful not to damage the natural nail. Dip nails in Soak Off Remover for 10 minutes. Uplift the edge of One Phase with a cuticle pusher and peel it off. Remove the swollen gel with a cuticle pusher. WARNINGS: Harmful if swallowed, irritating to eyes and skin, may cause sensitization by skin contact. Handle and open container with care, avoid contact with skin and eyes. Wear suitable protective clothing and gloves. In case of insufficient ventilation, wear suitable respiratory equipment.